Vol Au Vents Puff Pastry Recipe | Simple. Tasty. Good. Have you ever wondered how to make vol au vents? Did you know that there’s a very easy way to prepare them at home? All you need is a sheet of ready-rolled puff pastry and a beaten egg yolk. If you’re brave enough, you can try your hand at making your own puff pastry at home from scratch! Puff pastry vol au vents (it’s commonly misspelled as voulevant) used to be very popular in the seventies. Love ’em or hate ’em: they still exist even until this day! You surely must have seen them before served as an appetizer stuffed with mushroom duxelles or crab salad topped with salmon roe. That’s the little bite version. If you see vol au vent on a menu in Belgium, it’s not only the puff pastry you’ll get but a whole main course. The puff pastry case will be larger and it’s stuffed with a classic chicken stew with meatballs and mushrooms in white sauce. This meal always comes with a portion of Belgian fries and a small side salad. It’s a very popular dish in Belgium and one of my all time favorites back home! I love making chicken vol au vents from scratch but if I don’t have enough time, then I buy them at a good deli or supermarket. 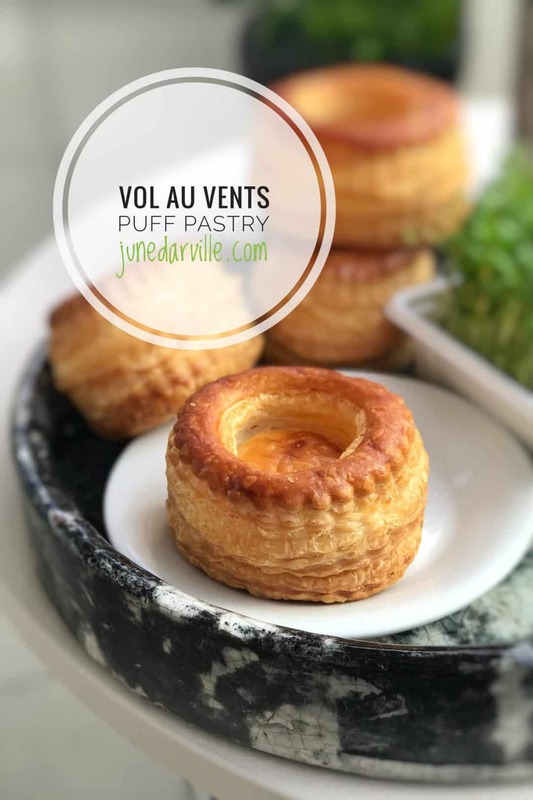 How to make vol au vents puff pastry cups: a step-by-step picture guide! 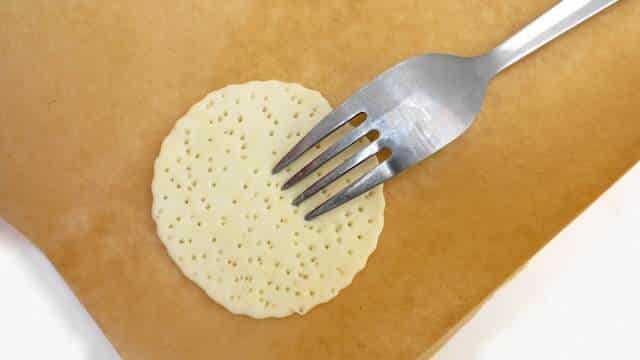 Place the puff pastry on a clean surface. With a metal serving ring, cup or a glass cut out 14 large circles, 3 inches (7,5 cm) in diameter. Leave 2 of these circles intact and then cut out the middle of the remaining 12 circles, creating rings. Then remove the middle circle. Prick holes in the 2 intact circles using a fork. 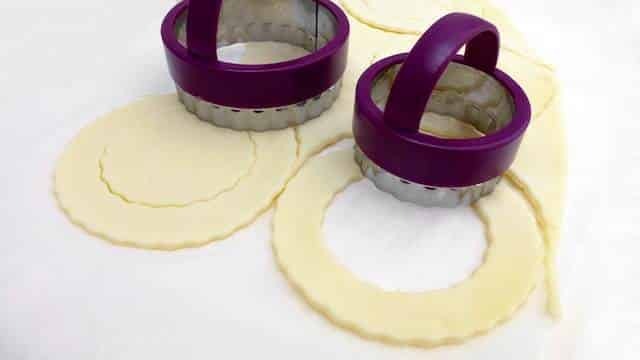 Once that is done, we can now start to assemble the vol au vent: place the 2 intact pastry circles and the 14 pastry rings on a clean chopping board. Brush them all with a little beaten egg yolk. Then start building up the vol au vent: place the pastry ring on top of the circle. 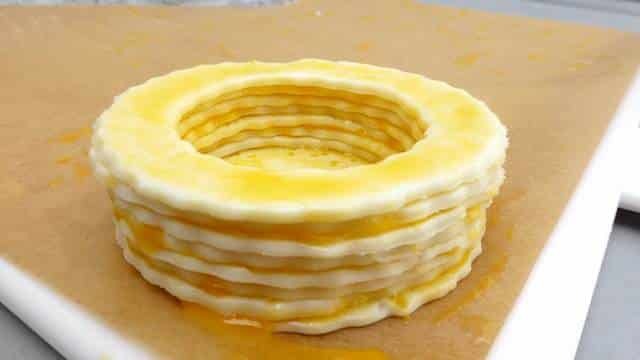 Keep on doing that until you have a nice little stack of puff pastry. 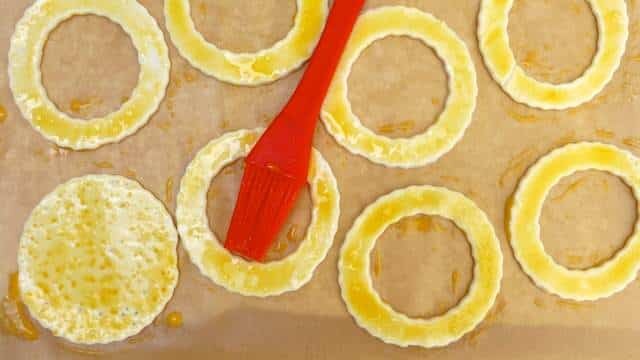 You can also use the mini circles you cut out and then brush them with the egg yolk if you don't want to throw them away. Place the 2 pastry towers (and the small circles) on a baking tray lined with baking paper. Bake them in a preheated oven at 374°F (190°C) for 25 to 30 minutes until golden and crisp. Keep an eye on them and cover with tinfoil if necessary. Then remove them from the hot oven and serve with your favorite filling! Have you ever made puff pastry at home? Well I have. But it kind of backfired on me to be honest with you. Don’t get me wrong: it was quite an experience and worth every minute that I put into it and I can assure that a bunch of minutes went into the process. Now at least I know how laborious and painstaking it is to make puff pastry. Would I do it again? Maybe. Maybe not. Let’s be honest: the puff pastry that you can find in the supermarket, well there’s nothing wrong with that product. And the end result is just perfect for pies, pastries, snacks and appetizer bites. So why wasn’t my homemade puff pastry a hit? Well I overworked it. No surprises there. In order to get puff pastry the dough has to be rolled out many times. I think I should have been more gentle with the dough. Fact is that when I baked my puff pastry it came out pretty rock hard, not that flakey at all. So how to make puff pastry? Well you start off making a basic lean dough using butter, flour, salt and ice water. Roll that out and then brush the dough with melted butter or sprinkle bits of cold butter. Fold the dough shut, roll it out, turn, fold it up, roll it out, turn, fold it up, roll it out… Repeat this a couple of times, but don’t forget to chill the dough in between these steps… Anyway, if you are really willing to try to make puff pastry yourself, there are many good pastry websites that offer great recipes with videos and pictures. I recommend Emma Christensen’s picture recipe: the pictures and explanation make it look so easy! And I’m sure it is. Lord, my fingers even start to tingle when I check her method… Shouldn’t I try to make puff pastry a second time? To do list, check! Key here is that you have to be gentle with the dough and that’s where I went wrong that first time. I should have known that the raw finished pastry wasn’t elastic and smooth at all in the end. As hard as a rock, and that’s what the finished product also looked and tasted like. Anyway I’m talking 5 years ago here, something that I would pick up much quicker now after all those years of cooking, baking and blogging. Like I said before, even though the result wasn’t good at least I was now able to say for sure how puff pastry is made. I do get those basic questions quite a lot so better be prepared, right? I don’t know, I should maybe give it another try. I’m not that much into baking but I could easily use the puff pastry to make a quiche of some sorts. Or croissants for breakfast. Sounds good though! Little flashback to my introduction: there I mentioned the Belgian chicken vol au vent stew. You can find this dish everywhere in very restaurant or brasserie. The puff pastry vol au vents are not always part of this dish anymore lately: quite some chefs prefer to cut puff pastry into rectangles, bake them i na hot oven to make them puff up and place the pastry on top of the hot chicken stew. Works for me as well, I don’t mind. You can find ready made puff pastry vol au vents here in lots of supermarkets, deli’s and baker shops and they are good as well. Homemade or store bought, you decide.